All local authorities with their partner agencies must develop and publish local frameworks for assessment, which must be based on good analysis, timeliness and transparency and be proportionate to the needs of the child and their family. Section 4, Communication was updated in December2018 to include reference to parents with learning disabilities. A child in need is defined under the Children Act 1989 as a child who is unlikely to achieve or maintain a satisfactory level of health or development, or their health and development will be significantly impaired, without the provision of services; or a child who is disabled. In these cases, Assessments by a social worker are carried out under Section 17 of the Children Act 1989. Children in Need may be assessed under section 17 of the Children Act 1989, in relation to their Special Educational Needs, disabilities, or as a carer, or because they have committed a crime. The process for assessment should also be used for children whose parents are in prison and for asylum seeking children. When assessing Children in Need and providing services, specialist assessments may be required and, where possible, should be coordinated so that the child and family experience a coherent process and a single plan of action. 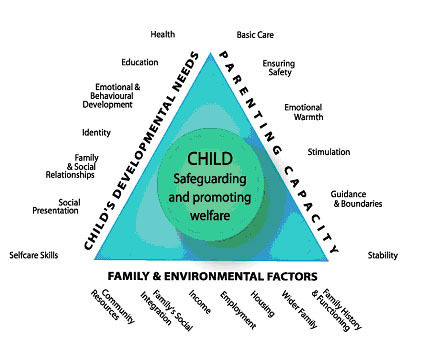 To provide support to address those needs to improve the child's outcomes to make them safe. The Assessment should be led by a qualified and experienced social worker supervised by a highly experienced and qualified social work manager. The parent's consent should usually be sought, before discussing a referral about them with other agencies, unless this may place the child at risk of Significant Harm, in which case the manager should authorise the discussion of the referral with other agencies without parental knowledge or consent. The authorisation should be recorded with reasons. In regard to longer term cases, assessment should be undertaken at 6 monthly intervals. Click here for links to Good Practice Guidance Tools. Where a child or parent speaks a language other than that spoken by the social worker, an interpreter should be provided. Any decision not to use an interpreter in such circumstances must be approved by the Team Manager and recorded. NOTE: Where the parents have learning disabilities, it may be necessary to adapt communications to meet their needs – for further information, see the Rotherham Safeguarding Children Board Procedures, Children of Parents with Learning Disabilities Procedure, Good Practice. Assessment should be a dynamic process, which analyses and responds to the changing nature and level of need and/or risk faced by the child. A good assessment will monitor and record the impact of any services delivered to the child and family and review the help being delivered. Whilst services may be delivered to a parent or carer, the Assessment should be focused on the needs of the child and on the impact any services are having on the child. Whether there is any need for any urgent action to protect the child, or any other children in the household or community. The parents' involvement in the Assessment will be central to its success. At the outset they need to understand how they can contribute to the process and what is expected of them to change in order to improve the outcomes for the child. The Assessment process must be open and transparent with the parents. However, the process should also challenge parents' statements and behaviour where it is evidenced that there are inconsistencies, questions or obstacles to progress. All parents or care givers should be involved equally in the Assessment and should be supported to participate whilst the welfare of the child must not be overshadowed by parental needs. There may be exceptions to the involvement in cases of sexual abuse or domestic violence and abuse for example, where the plan for the Assessment must consider the safety of an adult as well as that of the child. All assessments undertaken should include reference to the child's network to include, but not limited to, the wider family and informed by a detailed and deep genogram. The assessment should consider the contribution that the network can make to the child's welfare and what steps are required to ensure that this has a positive impact for the child. The child's network should be consulted with the involvement of the parents by means of a Family Network Meeting or Family Group Conference (see Local Resources). In a High Court judgment (Nottingham City Council v LW & Ors  EWHC 11(Fam) (19 February 2016)) Keehan J set out five points of basic and fundamental good practice steps with respect to public law proceedings regarding pre-birth and newly born children and particularly where Children's Services are aware at a relatively early stage of the pregnancy. An increasing number of cases involve families from abroad, necessitating assessments of family members in other countries. However, the Court of Appeal has pointed out that it might not be professional, permissible or lawful for a social worker to undertake an assessment in another jurisdiction. CFAB advise that enquiries should be made as to whether the assessment can be undertaken by the authorities in the overseas jurisdiction. UK social workers should not routinely travel overseas to undertake assessments in countries where they have no knowledge of legislative frameworks, cultural expectations or resources available to a child placed there.